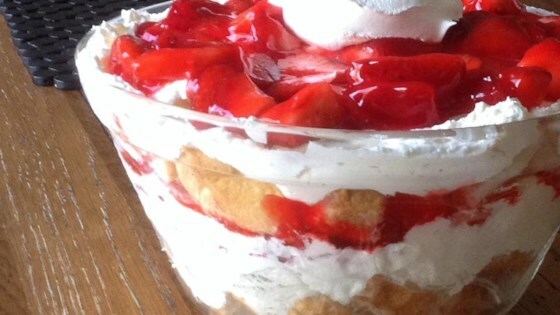 "Angel food pieces are topped with sweetened cream cheese, whipped topping and strawberries in glaze in this chilled, layered dessert." Crumble the cake into a 9x13 inch dish. Beat the cream cheese and sugar in a medium bowl until light and fluffy. Fold in whipped topping. Mash the cake down with your hands and spread the cream cheese mixture over the cake. In a bowl, combine strawberries and glaze until strawberries are evenly coated. Spread over cream cheese layer. Chill until serving. Layered dessert with angel food cake, cream cheese, and strawberries.